NEW ORLEANS—On the heels of Texas A&M’s Deon Lendore winning the men’s Bowerman Trophy (and headlining the men’s preseason Watch List for this year’s award), the state of Texas is primed to also take over the women’s award. Five of the ten women on the preseason Watch List for collegiate track & field’s highest individual honor, announced Thursday by The Bowerman Watch List Committee, go to school in Texas. Olivia Ekponé SR Texas A&M Sprints Germantown, Md. Shamier Little SO Texas A&M Hurdles Chicago, Ill.
Jenna Prandini RS JR Oregon Sprints/Jumps Clovis, Calif.
Kendell Williams SO Georgia Combined Events Marietta, Ga.
Those five are headlined by returning finalist Courtney Okolo of Texas. The collegiate record holder in the outdoor 400 is one of two Longhorn women with college records on the Watch List; her teammate Kaitlin Petrillose has the pole vault indoor record. Each won the NCAA title in their record-breaking event in 2014. The other three Texans on the list compete for Texas A&M. Two are versatile sprinters: Olivia Ekponé and Shamier Little were together on the 4×400 meter relay that finished second to the Okolo-anchored Texas quartet at outdoor NCAAs. Ekponé also anchored the winning 4×100, and Little ended her season by winning the IAAF World Junior Championship in the 400 meter hurdles. Shelbi Vaughan is the third Aggie on the Watch List: she’s the defending NCAA champion in the discus. Vaughan has the sixth best discus mark in college history, and the best ever for a thrower from a non-Pac-12 school. Okolo, Petrillose, Williams, Little, and Vaughan are joined on the Watch List as active individual NCAA champions by Alabama’s Remona Burchell, Clemson’s Natoya Goule, Georgia’s Kendell Williams, Oregon’s Jenna Prandini, and Princeton’s Julia Ratcliffe. In addition to Okolo and Petrillose, one more woman on the list has a college record: Williams broke the collegiate pentathlon mark in her winning effort at indoor NCAAs last March. Burchell won the indoor 60 meters and outdoor 100 in 2014; Goule, while at LSU, won the indoor and outdoor 800 in 2013; Williams won the indoor pentathlon and outdoor heptathlon in 2014; Prandini won the outdoor long jump in 2014; and Ratcliffe won the hammer in 2014. 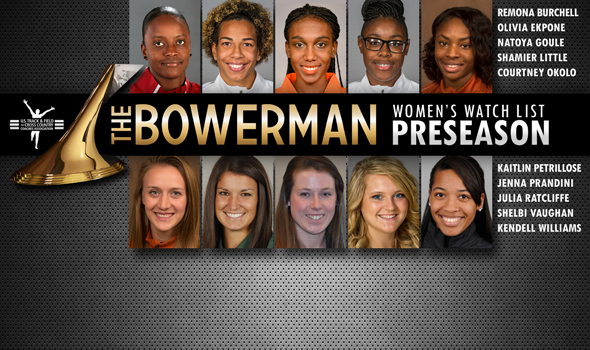 Eight of these ten women were either on the Watch List at some point or named a semifinalist last year. Though they made the semifinalist cut, this is the first Watch List for Prandini and Ratcliffe, and it’s the first time that Goule and Little have been under any type of Bowerman consideration. The five conferences represented—the SEC, Pac-12, Big 12, ACC, and Ivy—are no surprise. Those five leagues are the five with the most Watch List appearances; with Ratcliffe making the list (she’s the first-ever Princeton athlete to do so), the Ivy breaks a tie with the Big Ten for fifth. Though Williams is one of the youngest athletes on the list, this is her sixth appearance on it. That’s one more than Petrillose and Vaughan, who are making their fifth appearance. Despite the love for the Texas schools in the season’s first Watch List, Oregon still has the most appearances all-time on the Watch List with 61. The three schools with the all-time most appearances have produced the last three Bowerman winners: Oregon’s Laura Roesler (2014), Texas A&M’s Jessica Beard (2012), and LSU’sKimberlyn Duncan (2013). Both the Ducks and Aggies have had nine athletes appear on the Watch List; no other school has had more than four. There was no preseason Watch List in 2009. Out of the ten—five men’s and five women’s—since, six have included the eventual Bowerman winner. Oregon’s Laura Roesler and Texas A&M’s Deon Lendore are the reigning winners of The Bowerman, which is named for legendary Oregon track & field and cross country coach Bill Bowerman.